Four-color process printed on Side 1 of uncoated 150lb Manila Tag stock. Kankakee County's auditor can track criminal records and ongoing investigations with this handy file folder. 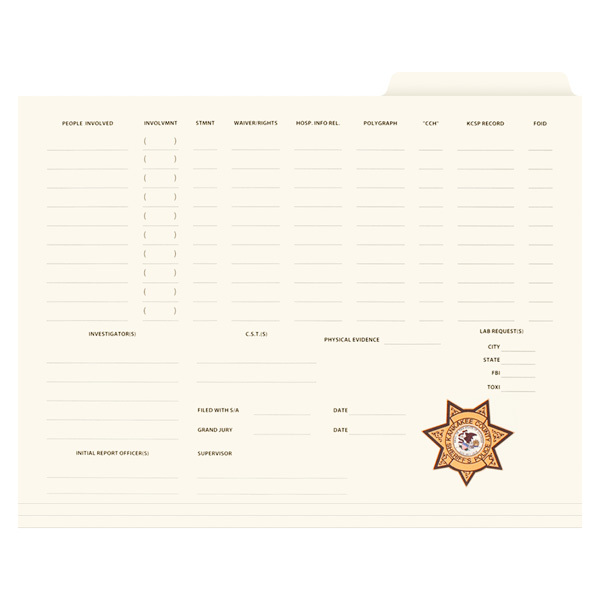 Forms on front let officials record case details, while the blank file tab allows them to create a custom label for the contents. The manila stock and matching gold sheriff's badge add a slightly rustic theme to the design that reminds viewers of Wild West law enforcement. Side 1 printed with 1 PMS color using light coverage on uncoated 150lb Manila Tag stock. Customers won't have to worry about their roofing or siding jobs—Pachner Exteriors is on top of the details with this file folder. Block letters in the company name (with a roof on top) indicate Pachner is an authority in its field. There is a space for customer insurance information and project notes on the cover, while a project checklist and space for additional notes are on the back. This product dares to be different with its 1/2" right file tab. The tab's off-center location helps prevent bending or wrinkling when being handled. 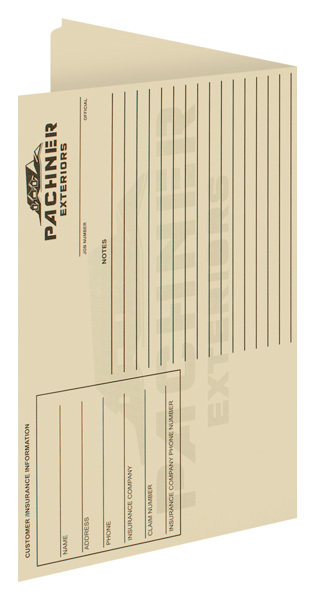 Imprint the tab with your brand's name, logo, or a label for the 8 1/2" x 11" documents inside. This product is available in portrait or landscape orientation; it's most popular in landscape, which fits easily into filing cabinets. Two 1/4" expansion scores on the exterior ensure that large quantities of paper fit comfortably inside.